From Marvel Comics it's Black Widow #1! CGC SS 9.8(Near Mint/Mint)! Iron Man Sketch & Signature by Jamie Jones! Bright cover, white pages, tight spine! Although we're sure you will be! PLEASE BE ADVISED: We are not resposible for loss or damage of item by carrier. If you have any questions let us know. Please check out our other auctions for more cool stuff! 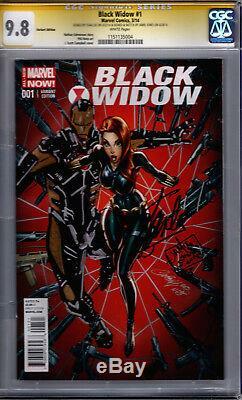 The item "Black Widow #1! Sketch & Sig by Jamie Jones" is in sale since Friday, January 18, 2019. This item is in the category "Collectibles\Comics\Modern Age (1992-Now)\Superhero\Other Modern Age Superheroes". The seller is "godfatcom" and is located in Tampa, Florida. This item can be shipped worldwide.